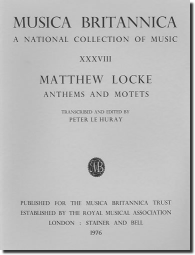 Locke's tour de force, 'Be thou exalted Lord', much admired by Samuel Pepys, is included here with nine other English anthems and six Latin motets to make a complete edition of the composer's works on sacred texts for four or more voices. String parts for four of the motets are available through the Made-to-Order Service. First published in 1976, reprinted with corrections 1986.